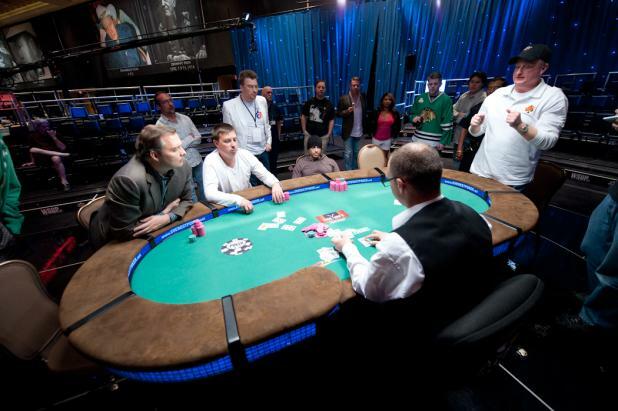 Maxwell Troy (left) has two cashes at the 2010 World Series of Poker, and made the final table both times. A week ago, he finished second to David Warga in Event #27 ($1,500 Seven Card Stud Hi-Lo), and on this night, he would finish second to Frank Kassela in Event #40 ($2,500 Seven Card Razz). 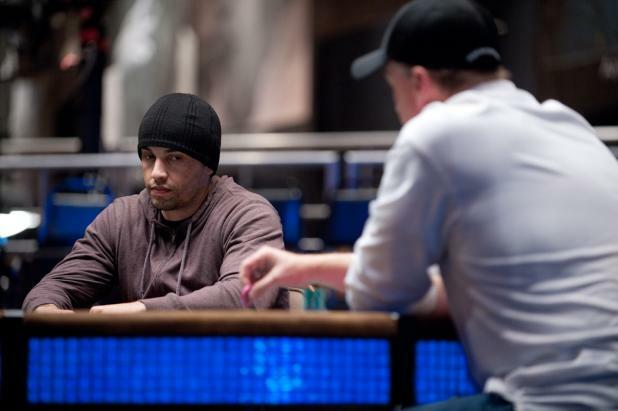 While it's frustrating to come so close without winning the bracelet, Troy has won more than $260,000 in those two events. With the power down at the original table, the final table of Event #40 ($2,500 Seven Card Razz) moved over to the ESPN stage, which had full power. 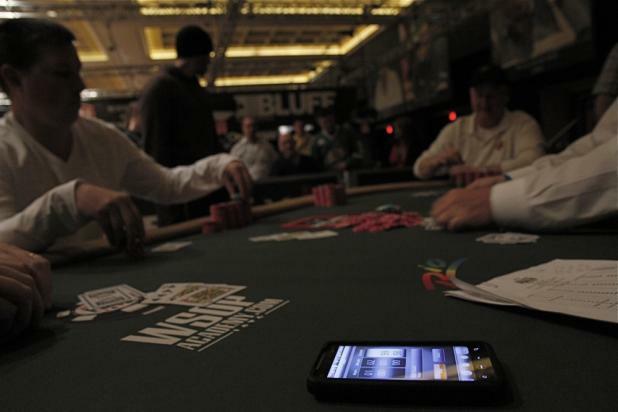 With the computers down and no power in the final table area, Tournament Director Bob Smith uses his iPhone as the tournament clock in Event #40 ($2,500 Seven Card Razz). When asked about the power outage, Frank Kassela would later say, "It was startling. All we did was cover our chips. I was just sitting in my chair in the darkness and lowered my hands and covered my chips." Kassela said that the power outage helped him to refocus. "It was definitely good for me that the power went out. It was a good thing. It was bad for my opponents." Shortly after 1:30 am, the power went out for 5-10 seconds in the Amazon Room (and, according to reports, along a sizable portion of the Las Vegas Strip). Luckily, limited lighting came back on to protect the integrity of the tournaments in progress, including the final table of Event #40 ($2,500 Seven Card Razz). With about five minutes left in the level, Tournament Director Bob Smith (standing, right) asked the final four players if they'd like to finish the level in the dim lighting and then take a break while they sorted things out. Frank Kassela smiles as he pulls in a big pot at the final table of Event #40 ($2,500 Seven Card Razz). Kassela has plenty to be happy about; at the end of Day 1, he had less chips than he started the day with. 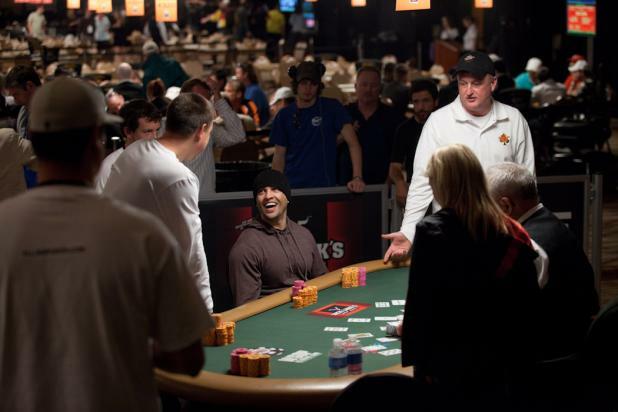 But he fought his way back and now sits at the final table with a chance to win his second WSOP bracelet in two weeks. A victory would also tie him with John Juanda for the lead in the WSOP Player of the Year standings. 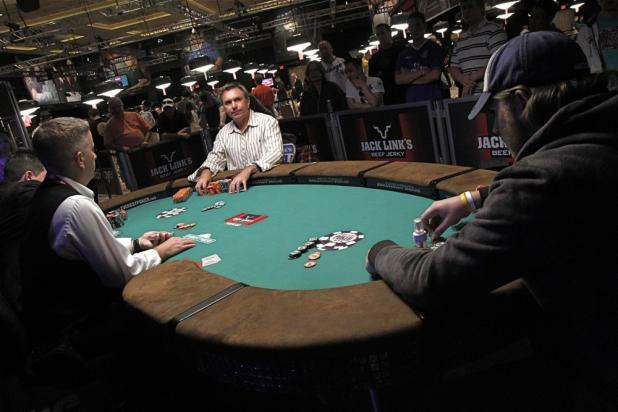 While ESPN is only providing full coverage for a few events (the $50,000 Poker Players Championship, the Tournament of Champions All-Star event and the $10,000 WSOP Main Event), their cameras have been on hand at any final tables where history was on the line. 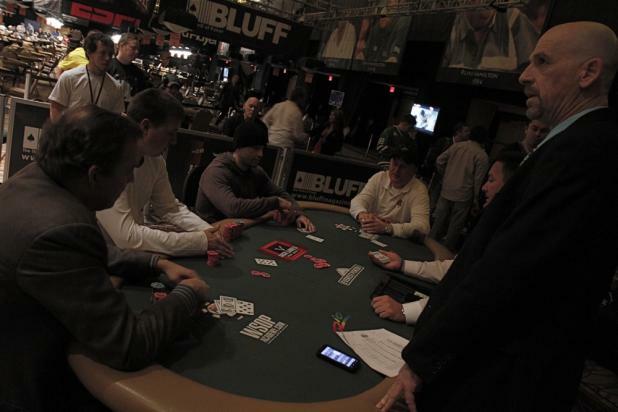 For Event #40 ($2,500 Seven Card Razz), there were three major storylines: Jennifer Harman going for the third WSOP bracelet of her career, Frank Kassela going for his second WSOP bracelet of the Series, and Russian newcomer Vladimir Shchemelev contending for WSOP Player of the Year. There is only one razz event each year at the WSOP, but Event #40 ($2,500 Seven Card Razz) turned out to be unique for a few unexpected reasons. With seven players remaining, all but one seemed more interested in playing the recently-started $10,000 H.O.R.S.E. championship instead of this final table. 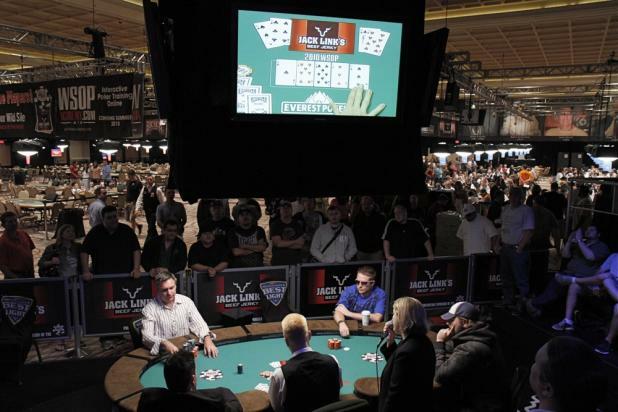 The players requested bumping the final table to the next day, but tournament staff refused. 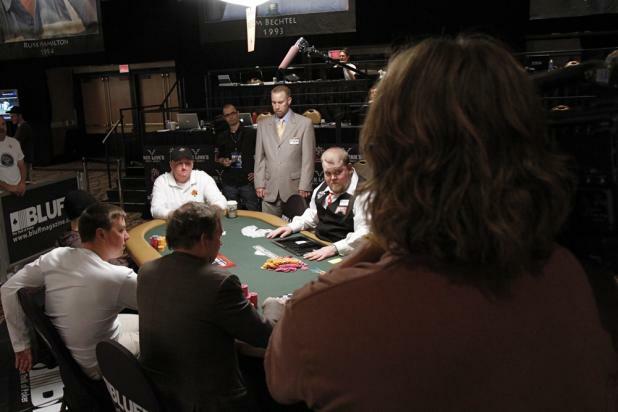 The players then tried coming up with a deal to end the final table, but Jennifer Harman refused, saying, "I don't buy bracelets; I win them." 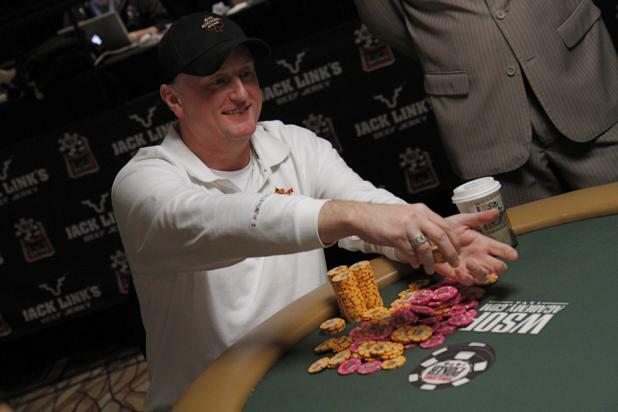 Frank Kassela added that he had a chance to be the first multiple-bracelet winner of the 2010 WSOP, and if he was, he wanted to win it outright rather than as part of a deal. So the razz final table played on. 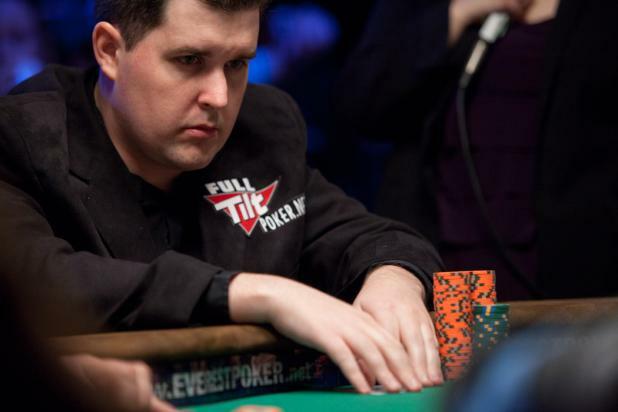 Scott Montgomery, who was an inaugural member of the WSOP's November Nine back in 2008, finally broke through his final table roadblocks to win a WSOP bracelet. It wasn't the biggest cash of his career, but one of the sweetest. Montgomery is the fourth Canadian to win a WSOP bracelet this year. "You Know Better Than To Three-Bet Me Light"
With three players left in Event #37 ($1,000 No-Limit Hold'em), Adam Richardson (center) raised preflop from the button, and Mick Carlson (right) reraised him from the small blind. Richardson stared him down for a while before reraising again, and Carlson quickly folded. Richardson said, "You know better than to three-bet me light." Danny Fuhs (blue shirt) moved his short stack of chips all in with K-9, and was called by Scott Montgomery (seat 1, bottom left) with pocket sixes (6-6). Fuhs never improved and he was eliminated in fourth place.